September 11, 2018 | -by: Kevin George. Update: This article was originally posted on Jul 12, 2017 and has been updated to add new kinetic email examples. Email marketing has evolved over the years, thanks to the advent of mobile devices and more and more email clients. Subscribers’ inboxes are packed with emails and to STAND OUT in the crowd is a challenge for email marketers. Getting the customers’ attention and getting them to open and click your emails calls for a hell lot of innovation and super cool interactive design elements. Adding interactivity in emails not only helps in increasing user engagement, but also helps in improving the conversion rates by creating highly impactful marketing campaigns. One way to do this is using kinetic design for your emails. Kinetic emails are designed around the concept of offering the users a visual experience through emails within the inbox itself. Such emails use a coding technique that enables creation and rendering of high-impact interactive emails. Designed around the concept of providing audience with information in an interactive and informative way, these emails stimulate a website experience without having to leave the inbox. Previously, when email clients such as Apple Mail had robust modern HTML and CSS support and majority of other email clients didn’t, designers had to code emails for the lowest common denominator. Check out what email advancements do Apple user enjoy. With the launch of iPhone, more email clients started to support modern HTML5 and CSS3. This gave designers and email marketers a reason to create mobile optimized advanced layouts for HTML email templates. As these email clients represent a large portion of the audience, for most of the marketers, kinetic emails help in improving user engagement. Interactive display in emails encourages quick subscriber interaction which reduces the time spent on scrolling through the email searching for relevant content. This results in improved unique click rates and click-to-open rates for your emails. Kinetic emails primarily include interactive email design elements like Sliders, Carousels, Search in email, GIF, Graphs, Menus, Rotational Banners, Scratch and Flip and Hover-over animation. Check out the ‘kinetic interactivity’ email by B&Q. The elements used in this email are user driven i.e. involve user engagement. It is certainly a great idea to create a holiday email like this one as it perfectly stands out from the rest of the Christmas emails. Including such interactivity requires extensive testing which involves allocation of more team resource. Unfortunately their availability is thin, especially during Holidays and EmailMonks can help you during such times of resource crunch. Wired Messenger has smartly used interactive element in their Halloween email by using ‘kinetic effects’. Such effects keep the subscribers hooked to your emails and make them look forward to more. They have used visuals that match the Halloween mood and beautifully amalgamated gamification plus interactivity in this email. Wouldn’t it be great if you can add the product featuring in the email to the shopping cart from there itself? 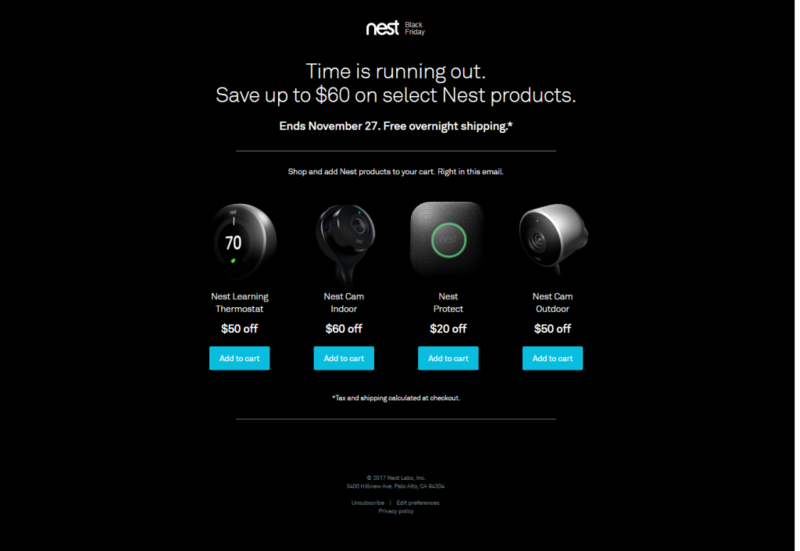 With the use of a ‘kinetic interactive’ email, Nest has introduced a hassle-free shopping experience by linking the cart functionality in their email. On checking out, they will be directed to their store at a single click, thereby saving the valuable time of their customers during the holiday season. Emails that use animation and CSS transitions to highlight the key content in an email are kinetic emails. These emails use automatic sliding carousels with each slide displaying a different set of content. Take a look at this example from Forever 21. These are emails that have additional elements that respond to user Kinetic interactive emails involve the use of the :hover, :active, :focus or :checked CSS selectors. The elements used in these emails are user-driven carousels containing navigation buttons and collapsible menus. This email from Adidas is a perfect example for kinetic interactive email. Kinetic effects in emails can embellish the email content by adding hover-over animations and attention focusing effects. Take a look at this email from the brand Lego that has used hover-over animation in their email. Kinetic emails also integrate fallback techniques to ensure that these emails do not render poorly on email clients that don’t support kinetic content and design. If you haven’t started using Kinetic design for your emails then this holiday calls for it. 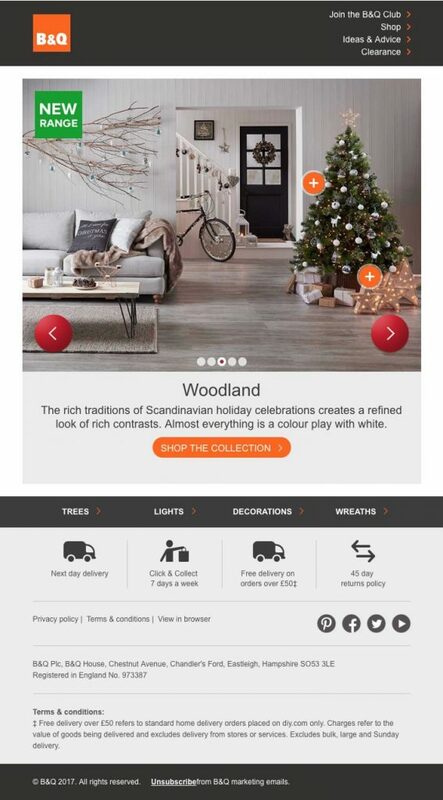 This holiday season increase the user engagement by incorporating kinetic email interactivity in your email campaign. Rely on my expert team of email coders at EmailMonks this holiday for a quick turnaround of hand-coded, Litmus-tested, high performing email templates with kinetic design that enthrals and fuels sales for your business. Contact us NOW! Wanna build awesome kinetic emails? Share your requirements with Monks.